We’ve talked in the past about helping vs. selling, and that the former approach takes you a lot further in the realm of social media and word of mouth marketing. Because helpfulness hasn’t historically been looked at as a marketing objective (tons of great stuff about this umbrella concept in Scott Stratten’s forthcoming new book UnMarketing – buy it), identifying areas where help could be provided isn’t in the DNA of most companies – yet. Diagnosing your potential helpfulness doesn’t have to have the complexity of drilling a relief well, learning the triangle offense, or even Mahjong. You just have to put on your customer glasses for a while and think through all the questions, confusions, and frustrations they may have at each stage. During my recent vacation in Canada, I stumbled upon a fantastic example of marketing via helpfulness, from Taxi Mike in Banff, Alberta. Mike drives a cab for Banff Taxi Taxi, and to stand out from the rest of the drivers, he produces an online and offline guide to the local hotspots. Taxi Mike’s Dining Guide is a simple, 8.5×11, tri-fold rack brochure, printed on bright yellow paper, and available for free just about everywhere in town. In his guide, Mike tells you the best BBQ places, clubs, happy hours, patios, places for kids, and other insider info. Wisely, he also includes a map of the downtown area on the front. 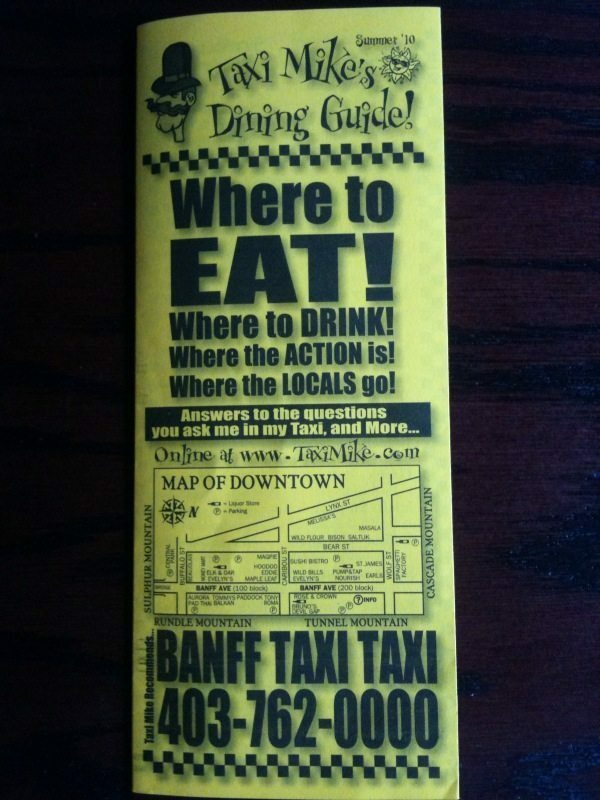 The portable size and map make it perfectly logical to bring Mike’s Dining Guide with you when out on the town in Banff. And then, when you’re blurry-eyed at 12:30am, you pull out the guide again and PRESTO! there is Mike’s phone number in big, bold letters. Total cost of this incredibly helpful marketing effort is very low, and Mike even offsets that by including ads from sponsors! Mike you are a helpful marketing genius. In another example of Canadian excellence in creating marketing success through helpfulness, a Starbucks in Richmond, B.C. (near the Vancouver airport) wisely has placed a logo on top of their location. Four high-rise hotels surround Starbucks like castle ramparts, each filled with caffeine-crazed travelers. 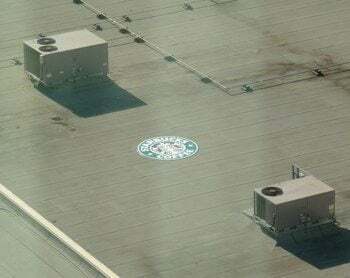 At least 50% of all hotel rooms (hundreds) have windows that look out directly on the Starbucks roof logo. Sure, it’s clever outdoor advertising, but given that “where am I going to get coffee tomorrow?” is a critical question on par with “does this room have bed bugs?” for most business travelers, it’s also incredibly helpful. Bravo. Ask your customer service team. These front lines warriors are the people most in touch with the concerns and questions of your customers and prospects. Have them document EVERY question they receive. When you find a pattern, create content to address it. This is the strategy of creating a Social FAQ. Ask your customers directly. Website surveys, email surveys, Facebook inquiries, focus groups, telephone calls to 25 customers each month. In addition to learning more about what questions and problems your customers may have with you, you’ll accrue a lot of goodwill just by asking. Internal search reports. If you have a search engine on your website, look at a report that shows what people type into that box. Those are usually the questions that not only are top-of-mind among website visitors, but are not satisfactorily answered with your current online content. Observe. You know how much you learn about your customers sitting in your office? Nothing. Make it a habit within your organization to “shop” yourself. Buy your own product. Call your own customer service department. Try to return something to your own company. Better yet, start a secret shopper program and augment your own observations with those of friends, family members, and customers willing to fill out a short shopper report. Compare. In addition to routinely shopping yourself, shop your competitors, too. The way they handle questions, friction, and sticking points can serve as inspiration or a warning to your efforts. Make sure you’re not just shopping who you think your competitors are, but also who Google says your competitors are, based on search engine results.